Marketing can drive even the most hardened entrepreneur up the wall. Branding, speaking your audience’s language, platforms and figuring out which marketing strategies are most effective for your target market can be a real challenge. If you’re feeling overwhelmed, it’s time to experiment with fresh ideas, such as influencer marketing, that can boost your marketing ROI and bottom line. Influencer marketing involves using key brand advocates to drive your message to the larger market in an organic way. It pinpoints people with large social followings who have sway over your target audience, then focuses marketing endeavors featuring those key influencers. Rather than marketing directly to a large group of consumers, you instead pay influencers to get out the word for you. For example, a testimonial from an individual influencer such as a journalist, academic, or YouTube personality plays the part of the buyer and talks or writes in length about the product’s features and benefits. Key leaders can also come from third parties, such as retailers and manufacturers. Take Damon and Jo – while the young couple were traveling the world, they filmed a YouTube travel show ‘for the social media generation’: Shut Up and Go. Their show became popular, not through ads or traditional marketing, but because their scrappy, on-a-budget travels and repartee appealed to an audience who found them on YouTube. Once they built that audience, brands like Toyota, Greyhound, and MTV partnered with them, paying them to ‘organically’ promote their goods and services. 70% of teenage YouTube subscribers trust influencer opinions over traditional celebrities. On average, businesses generate $6.50 for every $1 invested in influencer marketing. 81% of marketers who have used influencer marketing judged it to be effective. 51% of marketers believe they get better customers from influencer marketing. 59% of marketers increased their influencer marketing budgets last year. Let’s face it: people trust what other people (as opposed to corporations or advertising) have to say. This is why influencer marketing has become such a powerful and effective marketing strategy. Though you can’t immediately befriend thousands or millions of people, you can “befriend” one influencer. When you align your brand with an influencer, you are positioning your product or service for display to his or her already-established large network of individuals who trust what that influencer has to say. As outbound marketing continues to fall off and inbound marketing grows in popularity, influencer marketing has become one of the most effective techniques for attracting customers. Consumers of today are not the same as consumers of the past. They don’t listen to everything they hear on television or the radio. They don’t read billboards and take the information to heart. And they don’t trust large companies (at least, not until they take the time to get to know them and the company has earned their trust). They do, however, listen to what other people have to say. Influencer marketing can make up a large portion of an inbound marketing campaign. And here is how: they are staffed with the responsibility of generating and distributing content about your brand. When influencers recommend your brand to their following, they become an extension of your company’s marketing department. Even though influencer marketing is a relatively new strategy, it continues to be a viable solution for marketers who are willing to think outside the box on building trust with their target market. There aren’t many things that drive sales more effectively than good ol’ word-of-mouth marketing: 92% percent of consumers say that they trust word-of-mouth recommendations more than any other type of advertising. This is part of an overall shift in how we prioritize word-of-mouth information over paid television, magazine and newspaper ads and it’s hard to ignore the power of these unofficial brand ambassadors. Influencer marketing provides an opportunity for companies to leverage the power of social proof, all the while relying on those who already have a large following. Nowadays, a website is no longer enough; companies want you to interact with them via their social channels. Consumers expect brands to bring the conversation to them, so influencers hold more power than ever before. By partnering with the right influencers, brands can create conversations that relate to their target audience. Influencer marketing can make up a large portion of an inbound marketing campaign because they’re staffed with the responsibility of generating and distributing content about your brand. When influencers recommend your brand to their following, they become an extension of your company’s marketing department. And speaking of inbound marketing, did you know influencers have a huge SEO benefit for you? If you’re ready to take the step of working with an influencer. Now that you have a clear idea of why brands are relying on influencer marketing, it’s time to take the next step. This means identifying the perfect influencer. These are the people responsible for the creation, communication and connection of all messages. Mavens look to consume and share what they find with others acquiring insights on trends. Salesmen are persuaders who possess incredible charisma. But Connectors build a network filled with a wide range of people and therefore possess a byproduct of exceptional reach. They are masters of word-of-mouth communication. Influencers combine all three characteristics, but think about what your company needs. If you have a tech-forward product, or sell avante-garde fashion, you’ll probably want to find an influencer that’s a maven. Salesmen might be good if you’re selling an online course and need someone who’s going to convince their following in a forward, not subtle, way. Connectors are great for products that make your life easier or fulfill an existing needs — products directed at making parents’ lives easier are often shared on these networks. An influencer is only an influencer if they can actually influence others. Makes sense, right? Simply put, the larger the reach, the larger the number of people who will see your product or service. An Instagram user with 1,500 followers may be able to generate some results, but an IG user with 150,000 followers can really push your message to your audience. Sticking with Instagram, you may find that a person with 15,000 followers receives an average of 500 likes on each update. Conversely, a person with 30,000 followers may only receive an average of 100 likes per update. While the person with more followers will put your brand in front of more people, the update may not receive as much engagement. This is a balancing act with a trial and error component. Depending on your budget, and the level of engagement per follower you want, you may want to look into a micro-influencer, or an influencer with a smaller (usually up to 10K) audience in a specific niche. Again, a macro-influencer may promote you to millions, but how many are really listening? Are they really willing to engage the way someone specifically in your niche would? How much do micro-influencers charge? One of the primary mistakes among influencer marketers is chasing after personalities with a large following and nothing else. As noted above, a large reach is a good place to start. But again, it’s not the only point to consider. You must make sure that the person’s audience matches your brand. For example, a swimsuit model with 100,000 followers could be the perfect target if you are selling women’s apparel. But would this person be able to do anything for your software business? Probably not. This influencer’s audience is not interested in software. There are two sides to influencer marketing: brands and influencers. On one side, companies are willing to pay influencers to push their product or service to their audience. Conversely, influencers are willing to push the product or service as long as they get paid a tidy sum for a small amount of work. Align yourself with people who take a “natural approach” to influencer marketing. They are willing to partner with some brands, but are selective about who they partner with. Just like any relationship, influencer marketing should be a two-way street. If your brand is the only party that benefits, you won’t be long for this strategy. You will eventually find that nobody wants to partner with you. 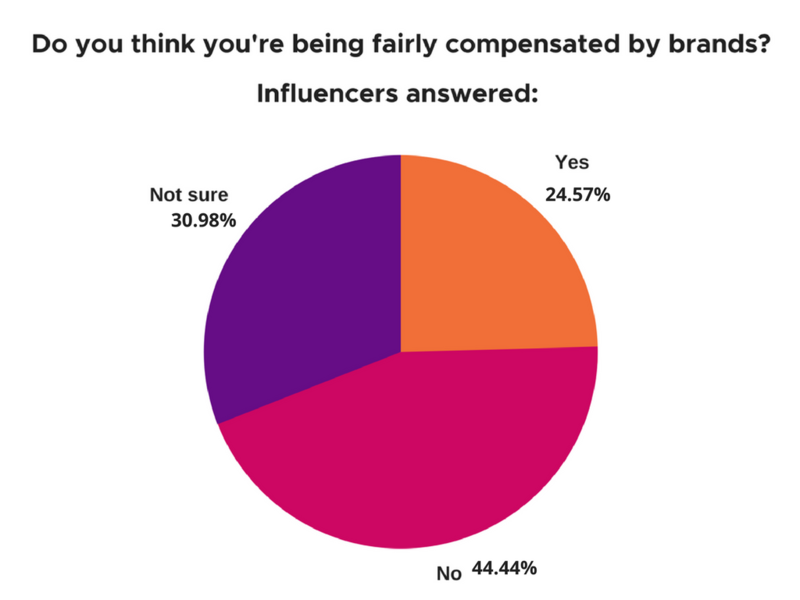 According to a study by Group High, 44.44% of influencers feel that brands/marketers aren’t providing them with fair compensation. Cold hard cash. 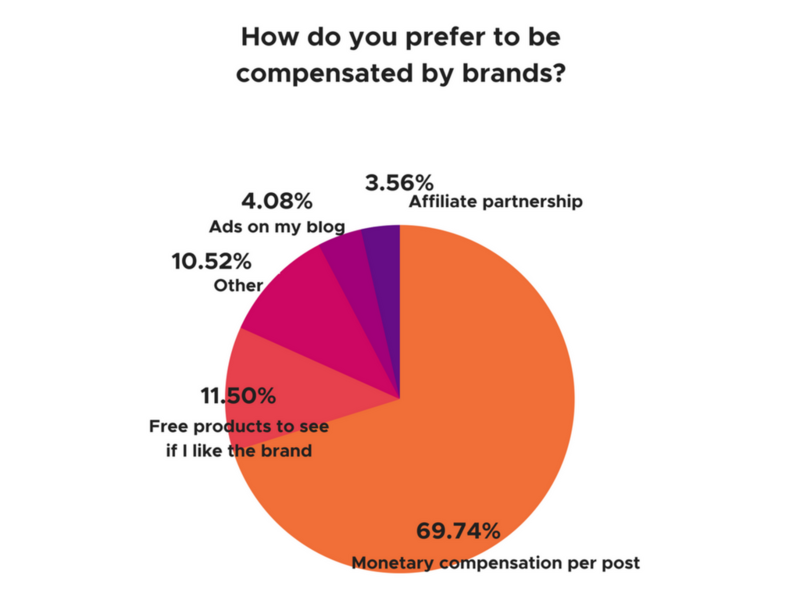 According to the same Group High study, 69.74% of influencers prefer monetary compensation for their posts. 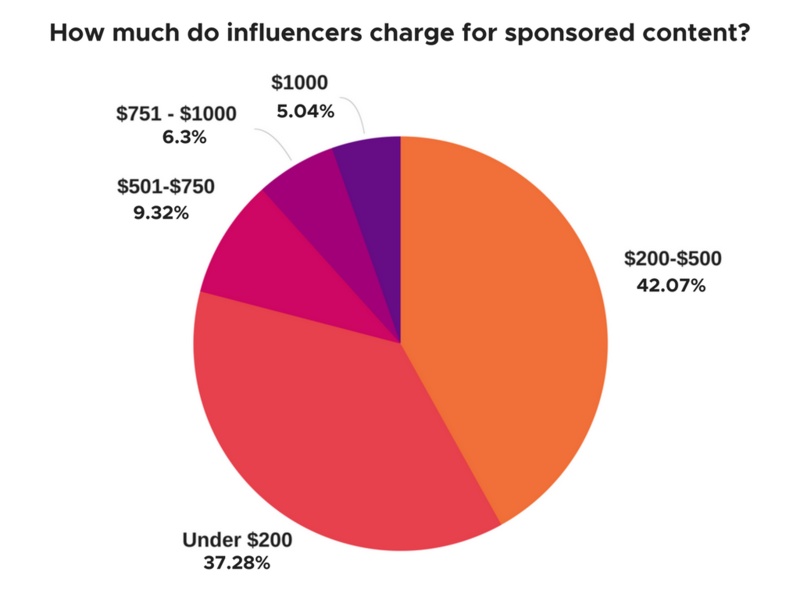 Among influencers charging brands for sponsored content, most of them (42.07%) charge between $200 and $500, 37.28% charge less than $200, and the remaining 20% charge more than $500 per post. Based on this information, paying your influencers should be your first choice. The only caveat with this is that the person may not be truly invested in your brand and therefore doesn’t put their heart into the project. This can be a downside to using this strategy, but if your company can swing it, the data confirms that this is one of your best options. But what if you’re a small company or startup don’t have the capital to compensate an influencer with money? Free product or discount. Why not offer somebody a free product or discount in exchange for a shout out? This doesn’t have to be the only arrangement, but it is a good way to build a relationship. Over time, you may phase this out and opt for another form of payment. Commission. This is a win-win, as both parties have skin in the game. You pay the person to share your brand with their audience and any sale they generate will result in a commission paid to the influencer. As long as you are fair with the commission structure, this is one of the best arrangements. With a mutually beneficial arrangement, your influencer marketing campaign will thrive. Last but not least, it’s important to set a budget. Keep in mind that a poll by influencer marketplace Tomoson shows that for every dollar spent on influencer marketing, businesses are generating $6.50 in revenue. Maybe you have a particular dollar amount in mind. Or maybe you are measuring this based on the time it takes to connect with influencers. It’s easy to go overboard with influencer marketing, as every opportunity will appeal to you in some way, so it is your job to stick to your budget and only spend money when it makes sense to do so. To do this, you’ll need to track your ROI. Not only does this show you what is and is not working, but it also puts you in position to tweak your strategy and increase your budget in the future. So now that you’ve read all about using influencers in your brand’s marketing campaign, maybe you want to dip your toe into being an influencer. Or maybe you’re already an influencer, and want to build reach and engagement? Well we’ve got that information, too! Check out these articles to learn the art of becoming a social media marketing influencer. f you agree with the 81% of marketers who believe that influencer marketing is effective, then there is no point in waiting any longer. You now know what this strategy can do for you in terms of brand awareness and ROI. You also know how to get started, so what are you waiting for?